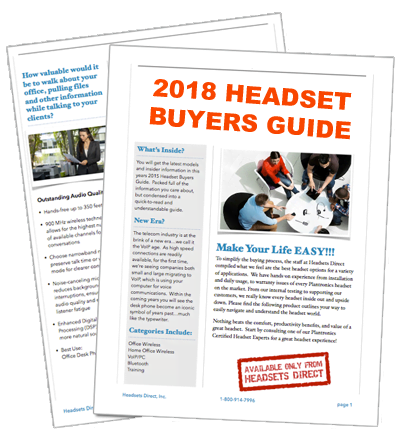 Plantronics CS361N - How to subscribe or pair your Plantronics CS361N Wireless Headset - Headsets Direct, Inc.
How to subscribe or pair your Plantronics CS361N wireless headset to the charging base. Place your new CS361N headset in the charging cradle for at least 20 minutes to charge. Once charged, remove the headset. To enable the multi-shift pairing feature, press the speaking volume up “+” button for 5 seconds until the red power light flashes on the front of the base. Place the headset in the cradle and the power light will flash red for 2 seconds. You have 10 seconds to complete the next step. Press either the “+” or “-” signs (headset speaker volume buttons) for 3 seconds. The headset talk indicator light will turn on (green) during pairing and then off indicating a successful pairing. Complete: If pairing was successful, your CS351N headset is now operational. If not, repeat the steps one more time or call a technician for assistance.